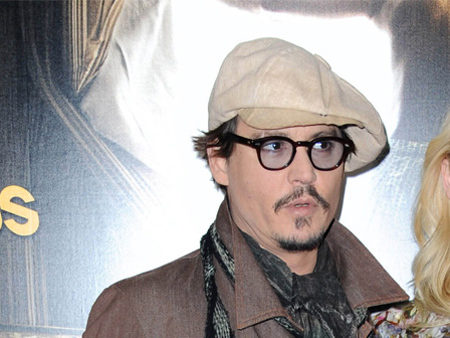 Johnny Depp has revealed he’s almost completely blind in one eye. The Dark Shadows star, who’s rarely photographed without a pair of tinted glasses, claims he’s been “basically blind as a bat” in his left eye since birth and the problem is impossible to correct. The 50-year-old actor, who’s also near-sighted in his right eye, told the July issue of Rolling Stone magazine all of his glasses are prescription pairs and he relies heavily on them. The actor, who has two children ? Lily-Rose (14) and Jack (11) ? with ex-girlfriend Vanessa Paradis, said he can only see a few inches from his face if he’s playing a character that doesn’t wear glasses or sunglasses. Meanwhile the actor, who’s now dating actress Amber Heard (27), also revealed he thinks about retiring from Hollywood “every day”, but is unlikely to do so in the near future.